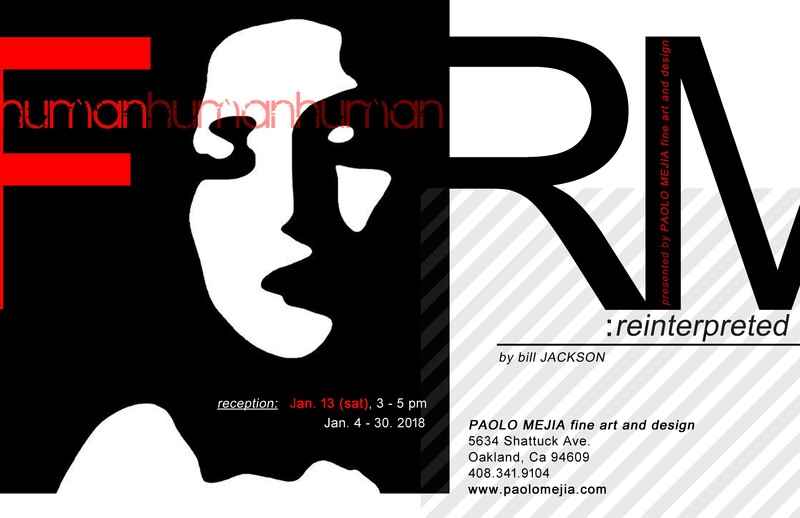 We would like to announce our next art show at our main gallery in Oakland entitled “Human Form: Reinterpreted” by Bill Jackson. He will be showcasing his new body of photographic work. In this exhibit, he explores the human form and transforms them in a simple B + W generated organic shape. Reminiscent of quazi-rorschach feel, he captures the essence of the body form in a minimal abstract visual effect. .
Come pass by our main gallery in Oakland this January and bring in a new year by seeing and purchasing new art. Here are pictures from November’s First Friday group art show. 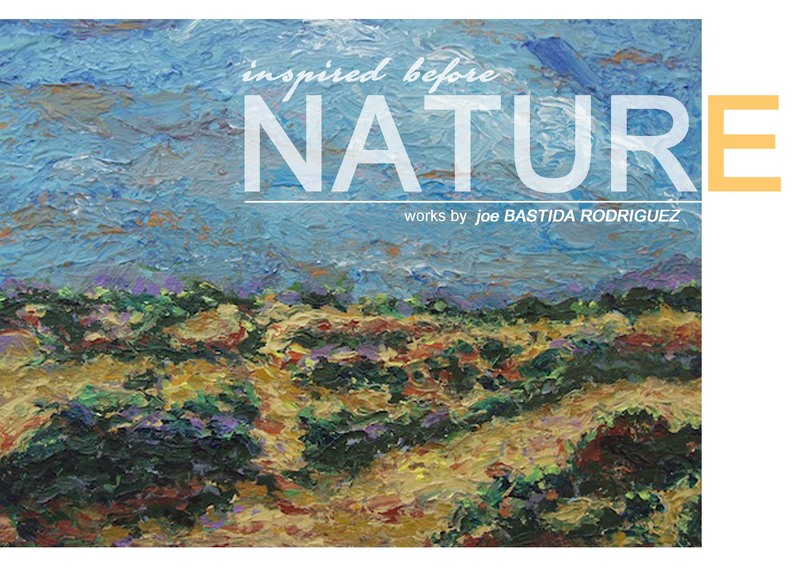 Our partner host, Foundry Commons, and San Jose artist group, Bloc5, would like to introduce “Inspired Before Nature” by Joe Bastida Rodriguez. This show will showcase a collection of his selected interpretive landscape paintings. His work will be on display in our San Jose annex facility until December 17. 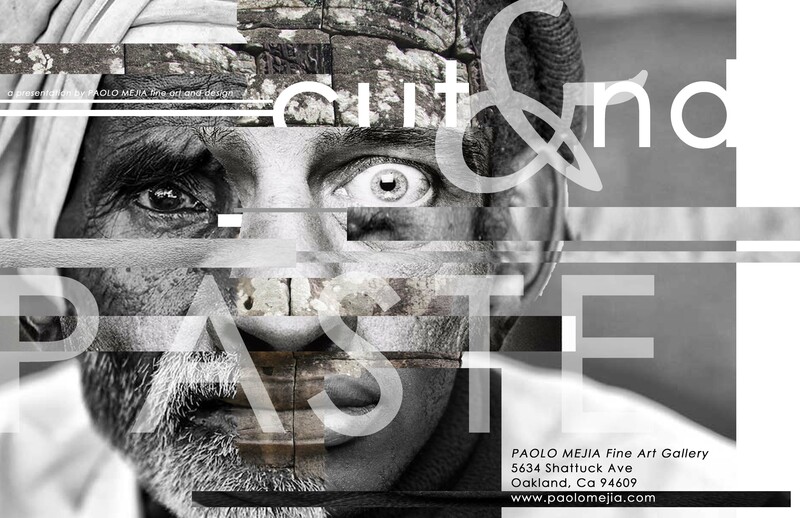 Paolo Mejia Fine Art and Design proudly presents “Cut and Paste” group art show. This grand opening group art exhibition is organized by art director and multi-disciplinarian artist, Paolo C. Mejia. Cut and Paste, will explore the multi-faceted processes of assemblage and collage work. Guest artists’ work on display will show various medium such as paper, metal, and wood. Their work will exert their craftmanship, skills and concepts. The strength and depth of their work relays a poetic visual art in 2D and 3D form. Come pass by our gallery this October through November. Meet and greet our guest artists at the opening reception, see a powerful and diverse collection of art, and start collecting their work. 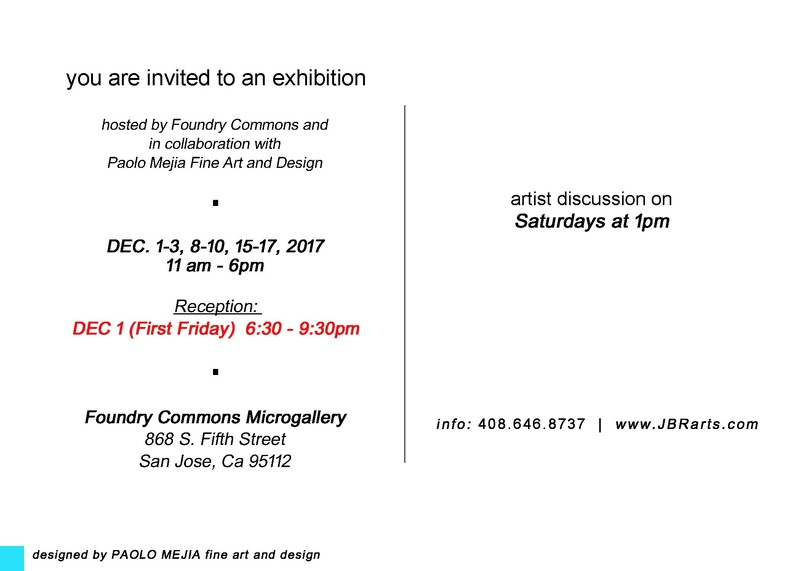 The Paolo Mejia Fine Art and Design, and Foundry Common management are collaborating together to bring to the community a group show by local Citadel artists. This group show will showcase the talent of these local artists with an eclectic group of work. 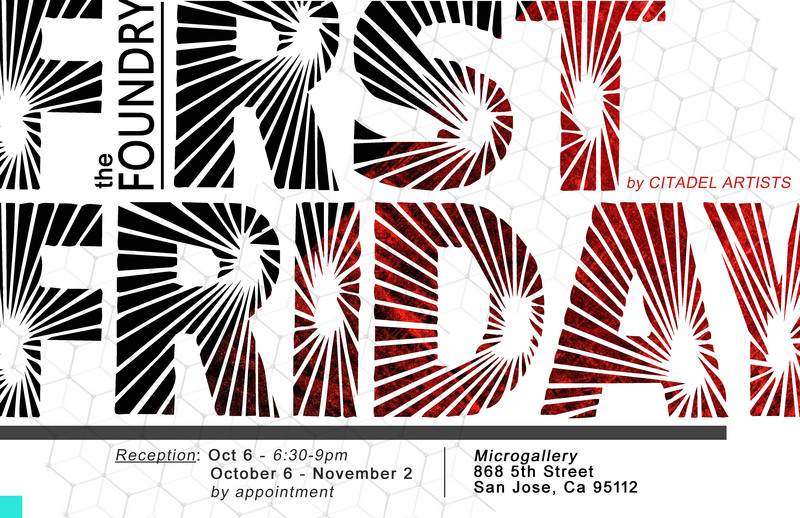 Come pass by this October 6 at Foundry’s Microgallery. 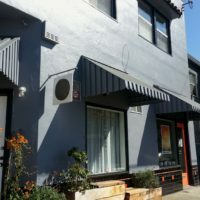 We at the Paolo Mejia Fine Art and Design and Jack London Square Realty will be hosting “Urban Cognizance”, a duet art show showcasing paintings by Michael Sacramento and Justin Pastores, at our annex facility in Oakland. Urban Cognizance is about creative awareness of Justin Pastores and Michael Sacramento’s environment. 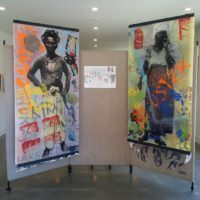 Justin observes and paints with a social perspective regarding immigrants and their response to living in a different culture. Michael acts as a recorder and interpreter of his immediate day to day surroundings. Being that they both live in the same environment in the San Francisco Bay Area, they seemingly share the same aesthetic. However, the effect of their artwork is nuanced by their subject matter and delivery. 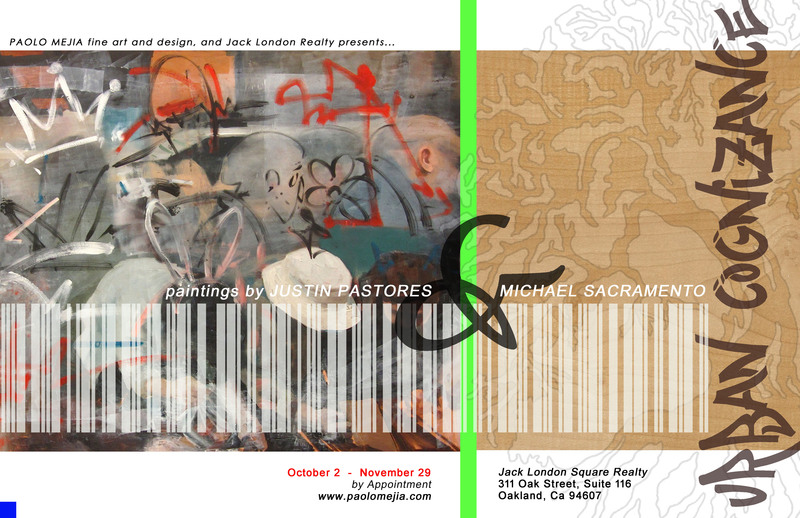 Justin tends to focus on people and with the use of a more figurative painterly style, while Michael focuses on the collage of surfaces and images. 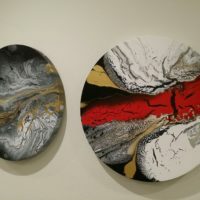 Together, Justin and Michael’s exhibition aims to provide viewers a new lens in which to see their world and inspire them to look at their surroundings with a keener eye. This art show will further explore and relay the idea of Acculturation theory and the Fourfold model through minorities who immigrate and raise their families in a new dominant hosting culture. Individuals, families, and communities respond with either Assimilation, Separation, Integration, or Marginalization. Other aspects along with the Fourfold model are responses to sub cultures, generation disparities, identity, gentrification, and the results of recession. Here are some pictures from “Current” group art show now showing this June at Foundry Commons in downtown San Jose. 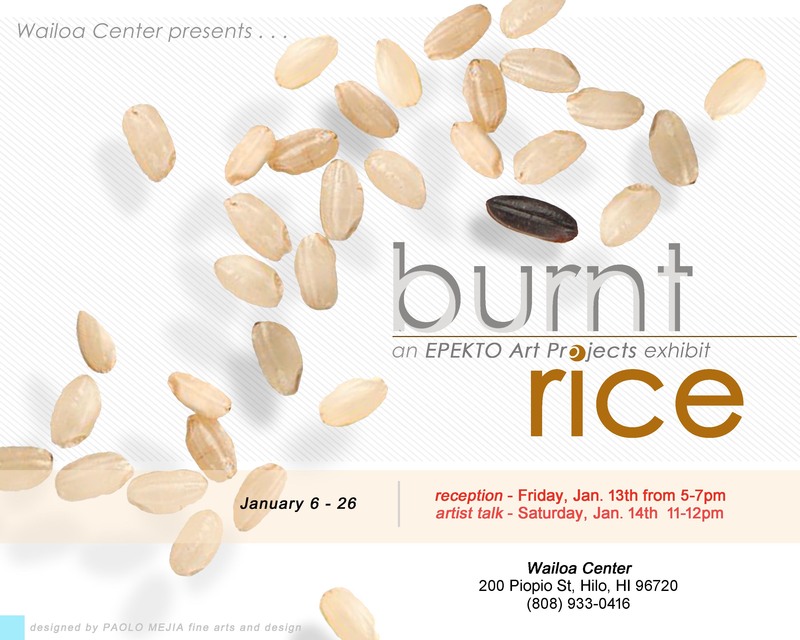 Here are pictures from our Hawaii group art show entitled “Burnt Rice”. While living in the US, our heritage stems from the Philippines; and many of us continue to hold a strong bond to our customs & culture. “Burnt Rice” explores these customs through the form of a spiritual connection to both plants and animals. Flora and fauna can symbolize a type of ‘grounding’ of energies. Rice holds a special link to both our culture as Filipinos as it is a staple to our diet and the plant itself is commonly seen throughout the archipelago of the Philippines. 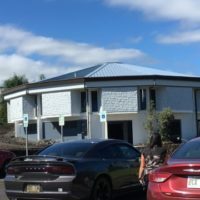 This plant is so directly linked to our being, as it provides physical sustenance, nourishes our soul, and continues our connection to our heritage. This will be Epekto Art Project’s first out of state exhibit.